Shop the most beautiful womens leather jackets here! 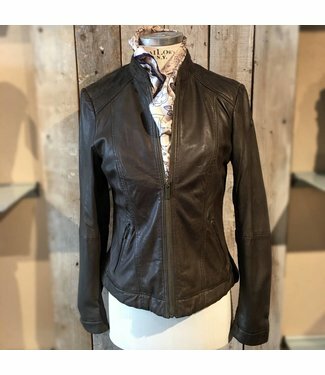 Here you will find a special collection of leather jackets and coats for women by the German jacket label Milestone and the label Cigno Nero from Austria. Always in the most beautiful materials and with special details. Timeless styles with a feminine touch. Leather jacket fitted style in black leather by Milestone. T..
Leather jacket in naturel brown with a collar and zippers Ci..
Leather jacket, fitted style in black leather, Ilona by Mile..
Leather jacket, fitted style in dark green leather by Milest..